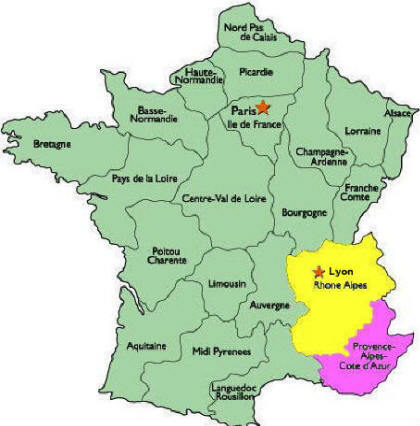 We are still in the Rhône-Alpes region (yellow) and now we are at the most northern part of it, in Lyon, the capital of the region. 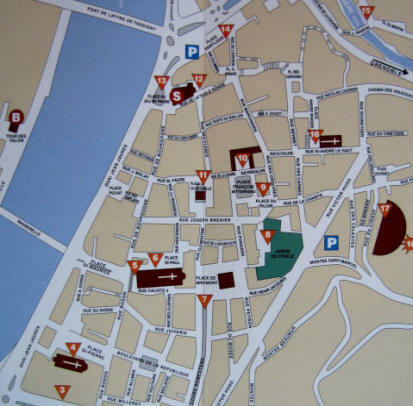 We've decided to spend several days here because there is a lot to see in this major city and we want to visit the Roman-ruins town of Vienne, which we will do today. 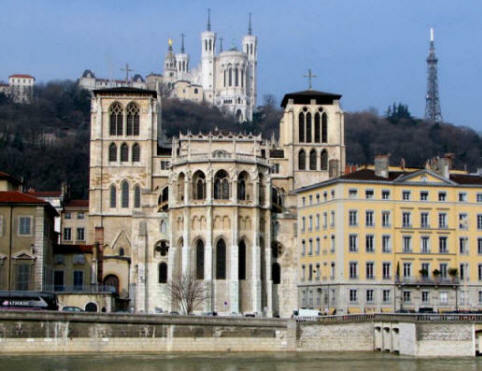 The city of Lyon is broken into areas due to the two rivers flowing through it. 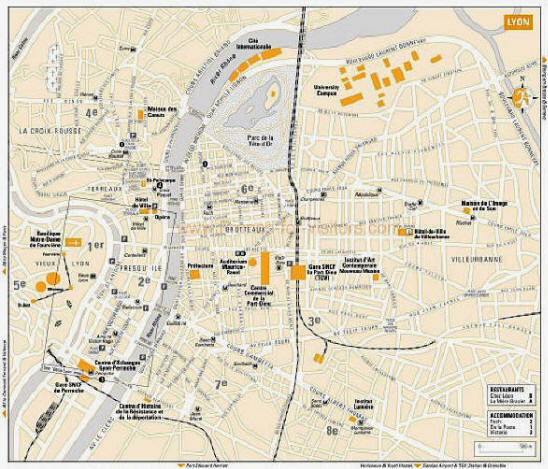 Old Lyon (Vieux Lyon) is situated east of the Saône River nestled in the loop in the river (below,) Presque Isle lies between the rivers and Bautteaux lies on the east side of the Rhône. 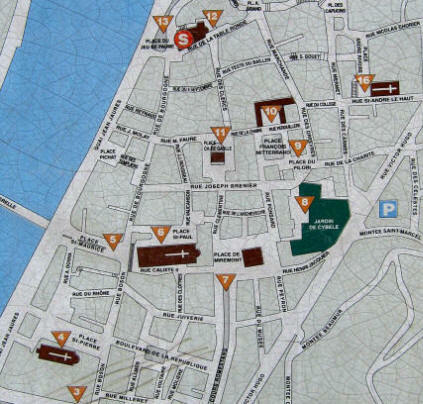 You can see from the maps below that Lyon is a huge city. 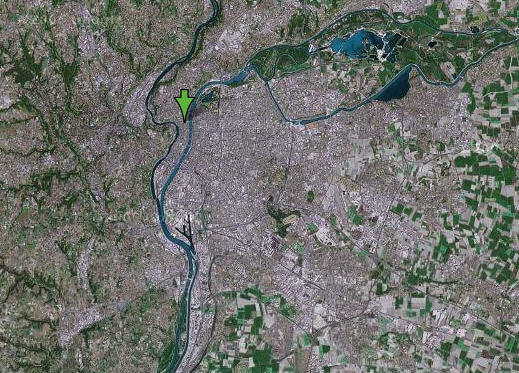 The Rhône River is the blue one on the right and the Saône is the darker line snaking down on the left. They join to continue as the Rhône. 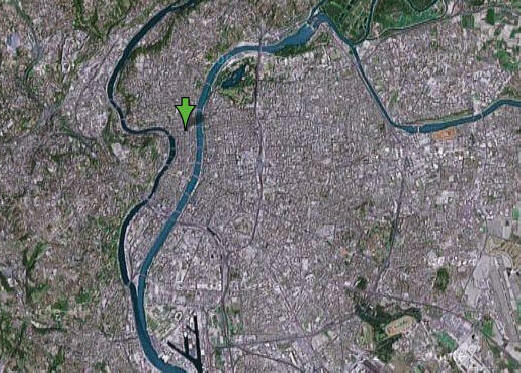 The green arrow points to the center of the city. I woke up at 9:15 and again at 9:40 when I got up to get ready to go to Mass. I discovered that my Sonicare electronic toothbrush wasn't taking a charge anymore; it was completely dead. So now I have to switch to a regular brush for the first time in more than 10 years. I know they do not sell Sonicare in Europe; I've looked before. The only electric toothbrush available is the Oral-B by Braun. My dentists have told me that I have to use Sonicare and thus I must figure a way to get a new one somehow. The Fourvière hill (above left) is on the west bank of the Saône River. On the hill is the Basilica and the Tour Métallique de Fourvière (Metal Tower) which is a smaller version of the Eiffel tower. 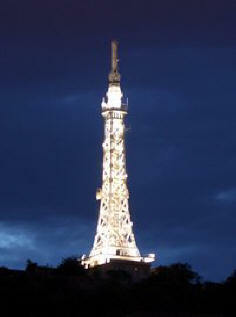 It was begun in 1892 and finished for the International Exhibition of 1894 in Lyon. It is 282 ft (86 m) tall and weighs 210 tons. It was built at the instigation of a Mr. Gay who wanted something secular on the mountain to offset the Catholic Basilica. 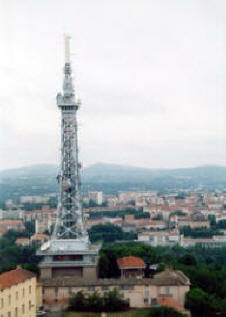 At a height of 0.23 miles (1220 ft, 372 m,) it is the highest point in Lyon. 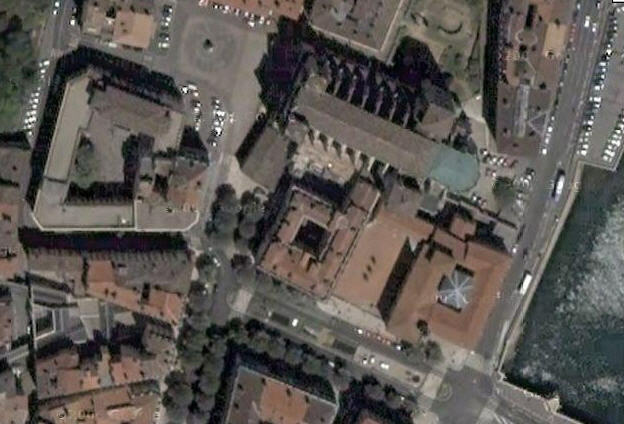 Below you can see the Basilica in the upper left and the cathedral in the lower right. 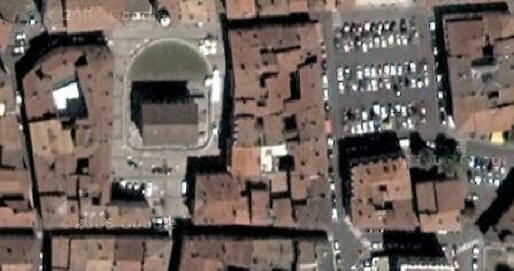 Below shows the cathedral abutting the river and the plaza at the entrance of the church. The cathedral was built in the 12th-Century. St. Pothinus (87-177 AD,) first Bishop of Lyon, (learned from and knew St-John, the Evangelist) was sent to Gaul by St. Polycarp (martyr 69-155 AD) about the middle of the second century. 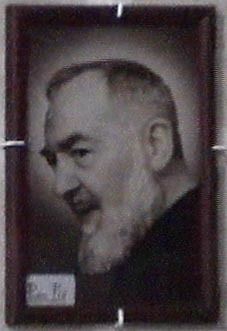 The legend says he was sent by St. Clement (dating from the 12th-Century) but it is without foundation. The letter addressed to the Christians of Asia and Phrygia in the name of the faithful of Vienne and Lyon, and relating the persecution of year 177, is considered as one of the most extraordinary documents; it is the baptismal certificate of Christianity in France. 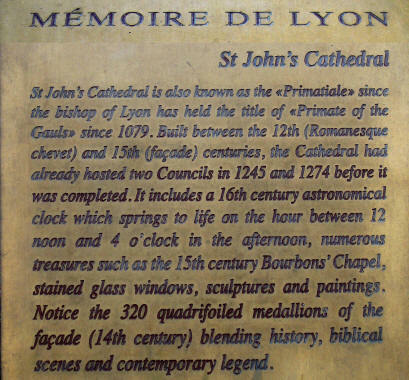 The successor of St. Pothinus (his church in Lyon, above left) was the illustrious St. Irenæus, bishop from 177-202. Below are shots of the cathedral. 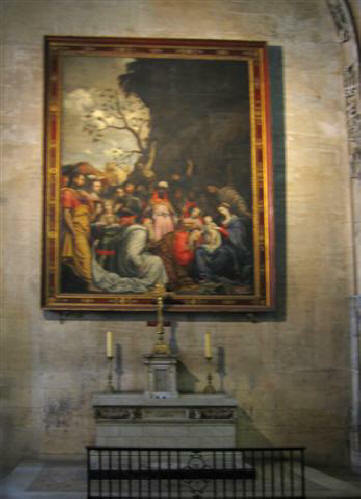 Below is a huge tapestry from the Middle Ages that took panning of several photos and uniting with PhotoStitch. The gold threads made it a very elegant piece. After the Mass, I decided to wait and see the big spectacle of the Astrological Clock working which was scheduled for noon and I had only 5 minutes to wait so I took some photos. The clock was built in the 1300s and shows religious feast days up to 2019. A crowd gathered and as we all waited in anticipation, the clock finally struck the noon hour. Then all the figures came out and did their things (photo right, above & below.) It was pretty neat. I then found the the famous 15th Century Bourbons' Chapel with the tombs of many famous people. After that, I left the church and at 12:15 I walked to the nearby Café de la Cathedral [6 Rue Saint-Etienne, +33-47-837-1510] which served me another one of those espressos with whipped cream they call a cappuccino. I tolerated it while doing a crossword puzzle and tried to relax. I then started walking the neighborhood to see the shops and then called Marcia to come and pick me up so we could head out. There is a funicular that leaves from this plaza and takes you to just above the Basilique on the hill. Also near here is Rue St-Jean and rue de Boeuf which is lined with huge expensive mansions built in Lyon's heyday. FNAC, my favorite electronics store, was closed on Sunday but what a fancy façade they had. At 12:45, I arrived at Café de la Ficelle [2 Avenue de la Doyenne, +33-47-842-2326,] a nice place on the corner near the cathedral and had a coka-lite waiting for Marcia. She picked me up at 1:15 PM to start our touring. 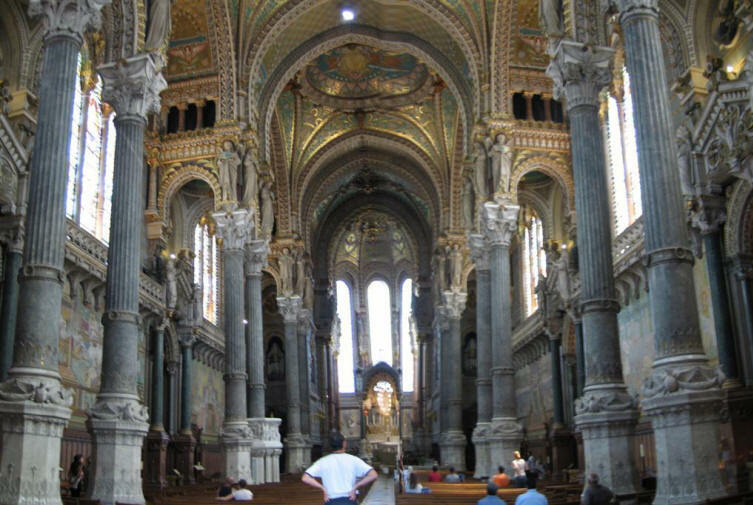 At 1:30 we drove up the hill to Fourvière to see the acclaimed Basilique Notre-Dame de Fourvière. It was built by architect Pierre Bossan in the late 19th-Century, after the Franco-Prussian War, to celebrate France's victory. 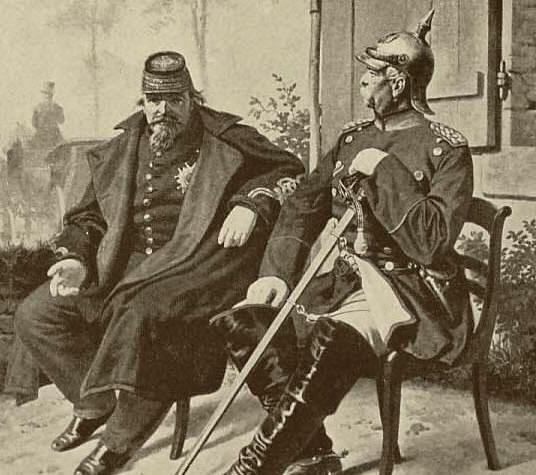 Below are the two combatant leaders, Napoleon III (left) and Otto von Bismarck. 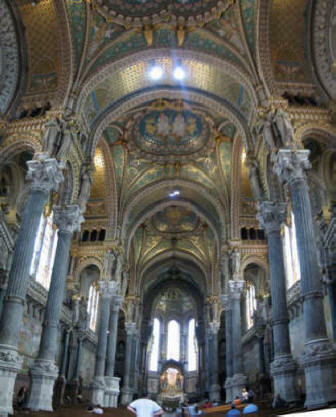 The Basilica is accused of being gaudy mock Byzantine. The Chemin du Rosaire is a winding path down the hill through gardens and trees which can be seen in the right side of the photo below left. The front of the church is quite elaborate and the detail of the upper façade (below) is quite exquisite. Below are some of the sculptures depicting Bible scenes along the front and sides of the building. Below is a view of the left side and the remarkable sculptured bronzes on the tall entry doors. Marcia grabs a few minutes of quiet repose. The stained glass windows were spectacular. At the end of the aisle there was a statue of the Virgin Mary and Infant. The interior art of this chapel was beautifully done. We then climbed back to the main level and then up to the roof level where we could see the large winged-lion statues up close. You can see the Tour Métallique in the background. From here you can see the main campanile tower with a golden statue of the Virgin at the top. Then we went back down to the main level to see the main part of the Basilica. 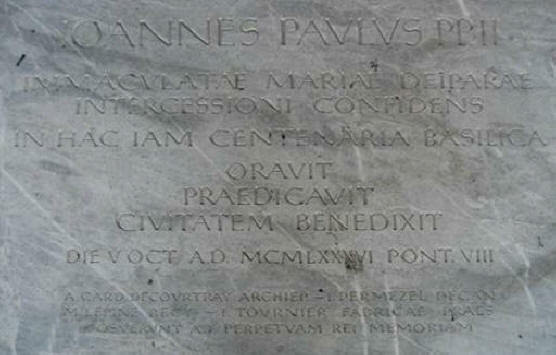 There was a plaque in the floor commemorating the visit of Pope John Paul II on October 5, 1986. There was also a stone Pieta. The interior of the Basilica was really very beautiful and difficult to take in in one photo. From the center of the main aisle (lower left) is a view toward the altar and on the right is the view back to the entry door. Getting closer to the altar, it took three shots to get it all in. This is what it looks like when you PhotoStitch the photos together. We finally left and walked around to the back of the Basilica where there is a large park with a lookout and this fabulous panorama of the city of Lyon. To the right you can barely see where the two great rivers join to form the Rhône. Now it was time for some serious touring. 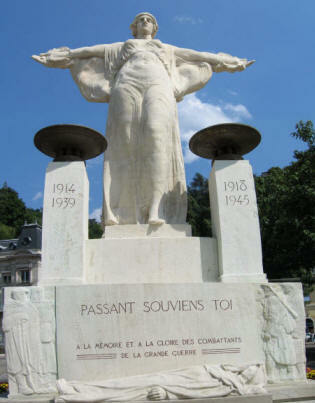 At 2:30 PM, Marcia drove directly south the 22 miles to the ancient city of Vienne. 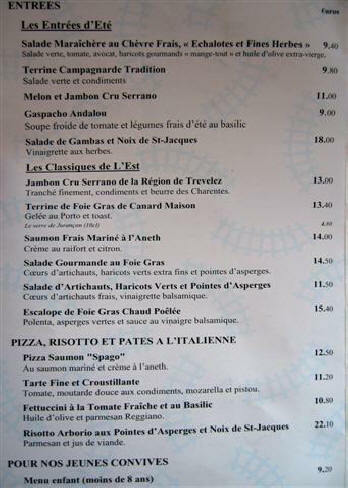 We were recommended to come here by our friend Serge Guerchon whom we met at dinner in Fréjus a couple of weeks ago. 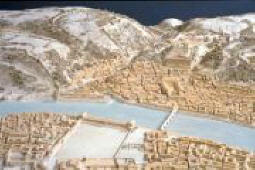 Vienne was an important trading town in Roman times (1st-3rd Century.) It was built on the site of the main settlement of the Celtic Allobroges tribe. This had been their capital city. 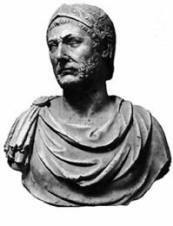 They were first conquered by Hannibal (photos) [247-182 BC] in the 3rd Century BC during his campaign to conquer Rome (Second Punic War) by crossing through here so he could cross the Alps with elephants and enter Italy. The history is fascinating if you click on the links. 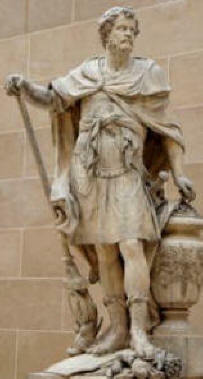 Below left is a statue of Hannibal in the Louvre that was done by Sebastian Slodtz in 1704. The silver shekels above were minted in 230 BC. 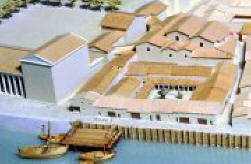 Later the Romans came and conquered the Allobrogians in the 1st Century BC and built what we will see here now. 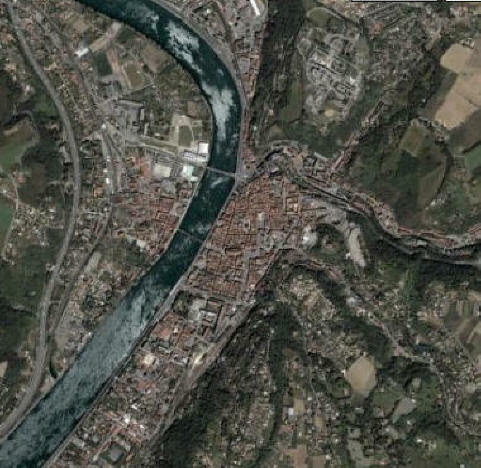 The city is strategically situated in a valley on the east side (right) of the Rhône River (photo left) and today has a population of 28,000. At 3:00 we pulled off the highway and found a parking spot in this lot at the entrance of the town. Towering in front of us is the mighty Cathédrale St-Maurice which looks a lot like the cathedral in Lyon. It is so huge you can even see the cathedral in the center of the city in the aerial photo at left. Below are the lists and maps they have to show you where all the many important sites are located. This is a place not to be missed. 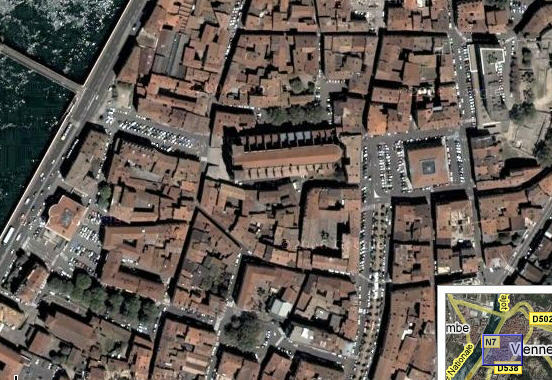 Below in the aerial view you can see the large city parking lot in front of the cathedral which replaces the usual restaurant-laden piazza you often see in Europe. As you can see the church is massive. All to honor an Egyptian Roman soldier, St. Maurice. We climbed the stairs and appreciated the fine detail above the central Gothic portal. Each stone carving represents events in Christ's life prefigured in the Old Testament. Below left is the right portal. We then went inside and this Romanesque church was huge. 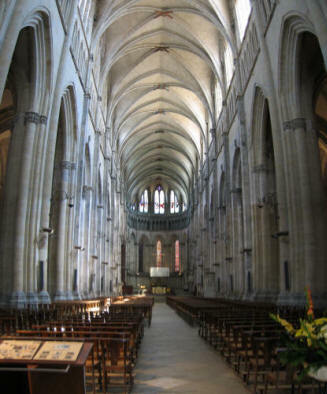 Gothic bays had been later added to the left and right sides of the nave. It was built between the 12th and 16th centuries. I was intrigued by the detail (below) of the crossings on the ceiling (above right) and how they were decorated. Perhaps the emblems were for regions in the area or families that had donated to the building of the church. Below is the main altar in the apse of this working church (lower left). Note the tapestries hanging. Below right is the view to the back of the church. 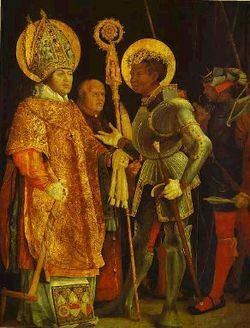 I wasn't really sure who St-Maurice was, so I had to look him up. 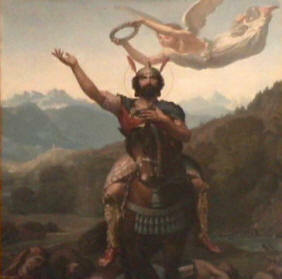 St-Maurice (also Moritz, Morris, or Mauritius) was a Roman soldier (left) of high rank who converted to Christianity and became the leader of the legendary Roman Theban Legion in the 3rd Century. 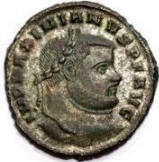 According to the hagiographical material, the legion, entirely composed of Christians, had been called from Thebes in Egypt to Gaul to assist Roman Co-Emperor Maximian (coin right,) which they did valiantly. However, when Maximian ordered them to harass some local Christians, they refused and Maximian ordered the unit punished. Every tenth soldier was killed, a military punishment known as decimation. More orders followed, they still refused, due in part to encouragement from Maurice, and a second decimation was ordered. So Maximian responded by ordering all the remaining members of the 6,600 unit to be executed including Maurice. The place in Switzerland where this occurred, known as Agaunum, is now St-Maurice-en-Valais, site of the Abbey of St-Maurice-en-Valais. Details of this story rest on tenuous historical grounds but was promoted heavily in later years. To the right is the painting "Meeting of Saint Erasmus of Formiae and Saint Maurice" by Matthias Grünewald (1517-23,) in the Alte Pinakothek in Munich. Above left is a sculpture of St-Maurice, from 1250 in the cathedral of Magdeburg, (East) Germany (red dot on map.) His body was taken there for final rest. This statue is one of the few where he is correctly displayed as a black man with African features holding a sword and wearing chain mail. Interestingly, it is in fact the oldest depiction of a black person in Europe. ... as well as in the Medieval stained glass (above right.) Below is a tomb altar in one of the Gothic side areas. As you leave through the side door, these Medieval stone carvings are said to be rather important historically. At 3:15 we decided to head in different directions. Marcia was hungry and wanted to find lunch and didn't want to climb the long hill to see the other Roman sites. So I headed up to the first site just off place de Miremont, the Théâtré de Cybéle which was a temple dedicated to the goddess Cybéle, whose worship involved orgiastic rites. The property was all fenced off and I couldn't find a way to get inside but the photos below give you an idea of its extent. I was able to enter the surrounding gardens; the Jardin de Cybéle. At 3:20 I started the long steep climb up to the foot of Mont Pipet off rue du Cirque to the Théâtre Romain and it was a killer. While getting a little lost following the signs, my legs cramped up several times and I had to sit down to rest - I was getting a little wobbly. Marcia was smart not coming. The theatre (aerial view left) is nestled into the Pipet hillside and is open 9:30-1 and 2-6 during the summer. 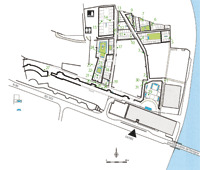 All the Roman artifacts recovered from here were moved to the Musée Lapidaire (see below.) 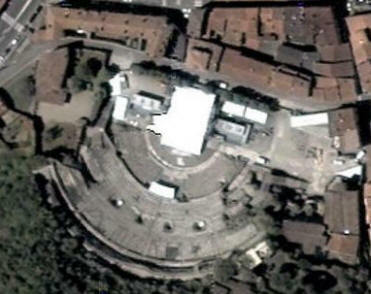 But, the payoff was to see one of the largest theaters in Roman Gaul. It was restored in 1938 and below is what it looks like from the floor of the stage. Sorry for the ripples due to stitching the photos. There are 50 tiers of seats and it can hold over 13,000 people. It is used today for many events including the Vienne International Summer Jazz Festival held annually the first two weeks of July; we just missed it. 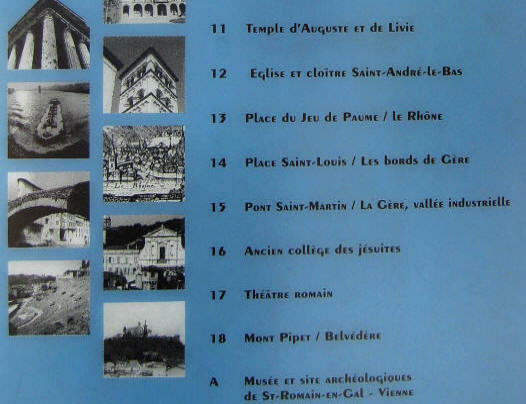 As hinted in the photo above, the view from the top row of the theater shows a spectacular panorama of the city and the Rhône River and the valley below. These climbs were killing this 61 year old man. I remembered Italy in 1997 when I could run up the tallest towers without a problem. What a difference 8 years can make at this time of life. Below is the ancient remains of the fortification on the top of Mt-Pipet. 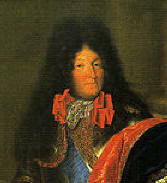 It was ordered destroyed when the King wanted fortifications only on the borders of France. Multiple attempts to destroy it were not totally successful and this is all that is left. I climbed back down the hill to the city and by telephone I found Marcia at 3:40 PM at the takeout restaurant she had just finished lunch at called Kabados. She sat in the tables in the park nearby and had a kebob that was just OK (big surprise.) I was extremely thirsty and got a coka-lite and climbed to the top floor to use their unusually inconvenient men's room. 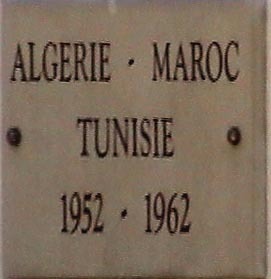 It is a memorial to the dead of World War I (De La Grande Guerre) and II as well as other French wars in Algeria, Morocco and Tunisia. 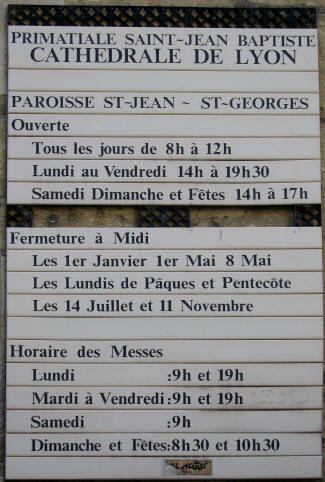 At 4:00 PM we walked to the old decommissioned church of Eglise St-Pierre [place St-Pierre, +33-47-485-2035, open 9:30-1, 2-6, closed Monday] which now houses the Musée Lapidaire (museum of stones) containing many of the Roman relics from the city and the Théâtré Romain. 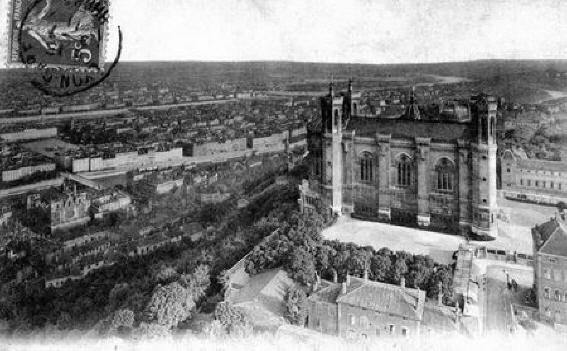 The aerial photo above shows the cathedral St-Maurice in the center; St-Pierre is in the lower left corner below the row of trees. The Rhône River is in the upper left. Below is the back side of the old church. Above the entry to the museum, St. Peter (Pierre) stands guard with his keys. Below we get closer and closer to the nave with many displays. The lady who took our entrance fee was kind enough to let me know I could not use my camera in the museum and then she ran off some where. She was very sweet. 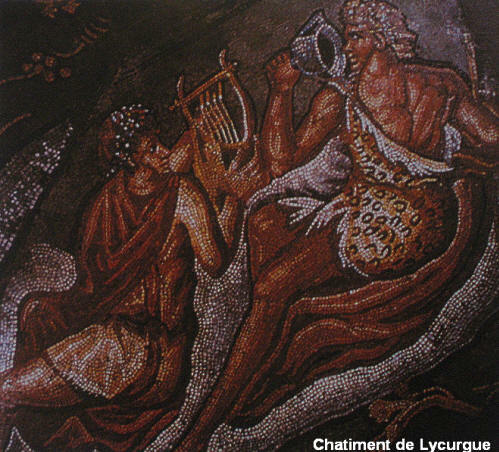 Below left is the excellent mosaic called "Mosaïque du Rapt de Ganymede." 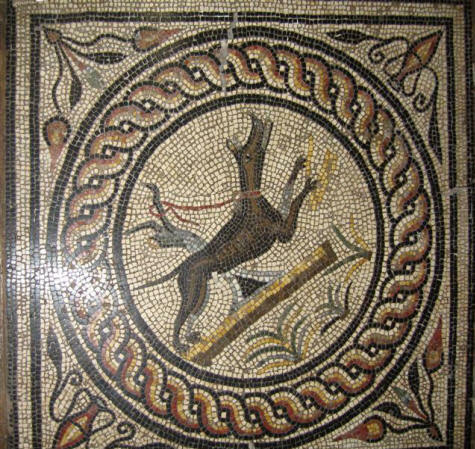 Below are photos Marcia and I took of this treasure trove of Roman antiquities. 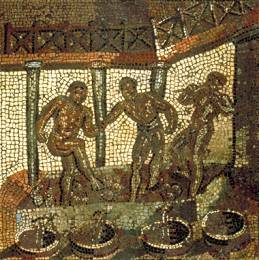 Above right are two Roman-era oil lamps. 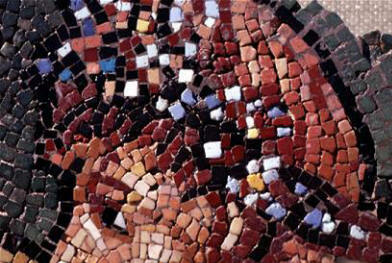 Below are photos of a beautifully preserved floor mosaic entitled "Mosaïque Des Masques" or mosaic of "The Masks." It is from the 2nd (IIéme) Century (siécle) AD (ap. 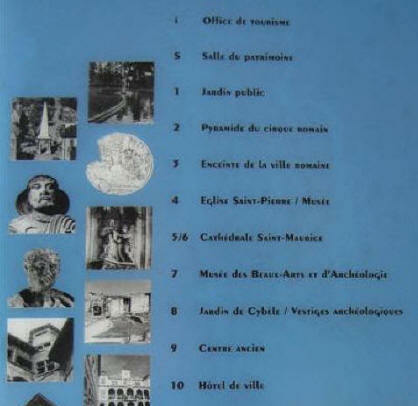 J.-C.) and found during construction in only 1978. All the above are "The Masks" except the last one which is a separate mosaic. 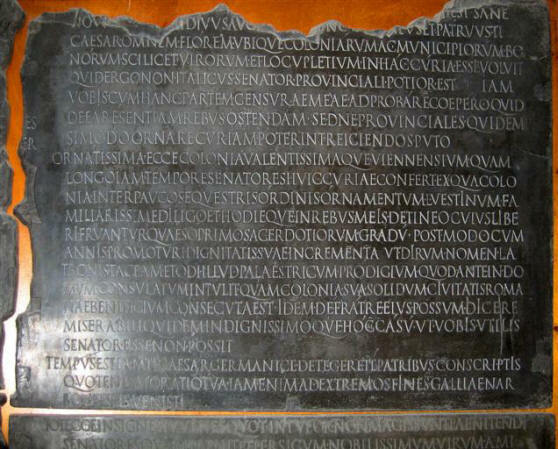 Below right is a stele with a "CAESAR" inscription on it. 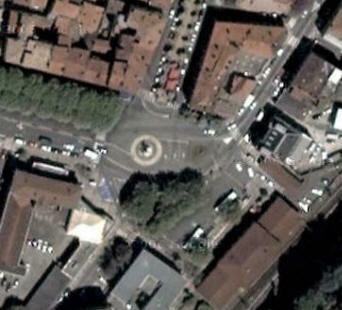 We got back to the car at 4:20 PM and drove to find the Pyramide du Cirque Romain which is located in the middle of a traffic circle that used to be the center of the Roman circus here. It is also called the Aguille monument and is purported to be the burial site of Pontius Pilate, which legend has it was banished here. The arch has four sides topped by an obelisk (not Egyptian, however) from the 4th-Century. At 4:30 PM we then drove to the center of town and found the Gallo-Roman Temple d'Auguste et de Livie (built in 10 BC) which is a beautifully preserved Roman temple devoted to Augustus and Livia. Below is the view from the rear right side. This rear part dates back to the 1st Century BC. And on the left is the view of the front right and on the right is the view of the front left. The Corinthian columns are very well preserved. 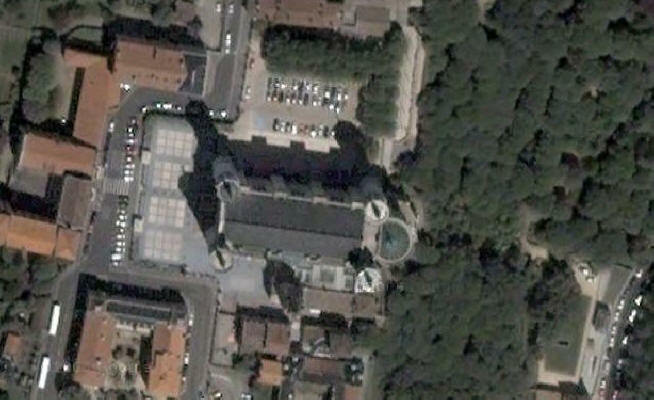 Below right is an aerial view of the temple in place du Palaise. At 4:45 PM, we got the car and drove over to the ancient church of St-André-Le-Bas (below left.) The central nave (below right) was built in the 12th-Century and the stained glass is from the Middle Ages. The stained glass, baptismal font and stone carving are all very old indeed. 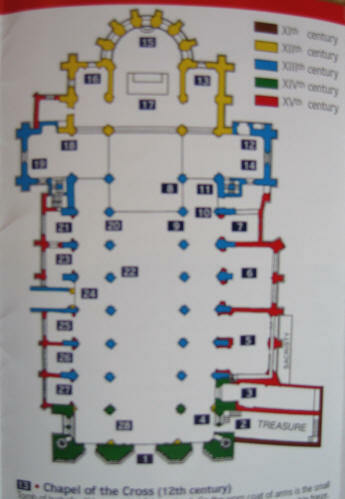 As noted in the diagram (below), #13 is the 12th Century Chapel of the Cross (left.) 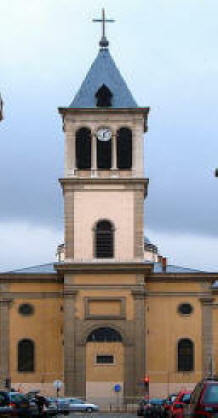 Over the years, the church was enlarged and completed to its present state in the 15th Century. We then drove the bridge across the river to find the Roman community St-Romain-en-Gal (100 BC to 300 AD) to see the Roman ruins. It was difficult to find because it was all very low. Below is a mural map of the area near the ruins. The site is on the left side of the river. There were high wire fences (lower left) all around it making it very difficult to visit. By now it and the Musée Archéologique [2, chemin de la Plaine, +33-47-453-7401, closed Mon) were closed. 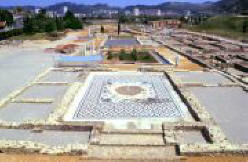 The museum houses the beautifully detailed Châtiment de Lycurgue (discovered in 1907, above right) and many other mosaics and objects first dug up during construction in 1967. 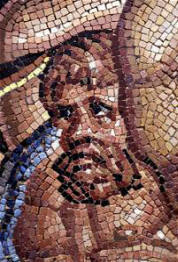 The detail of some of these mosaics (below) is quite incredible. We had to settle for a peak through the fence. I took this shot (lower right) through the wire fence This is what the remnant ruins looked like. Not very impressive. Since there was really not all that much left for us to see, we figured we ought to head back, so at 5:20 PM, Marcia drove the freeway north back to Lyon. We arrived at the hotel at 6:00 PM and we showered and spent time washing out some clothes. With those jobs done, at 7:00, I went down to the lobby and got a cappuccino and a coka-lite and worked on Diarios until time for dinner. It was a lovely evening. We then got the car out at 8:30 and drove to the old train station to meet my friend Kris Morrill who was joining up with us from her trip from London. 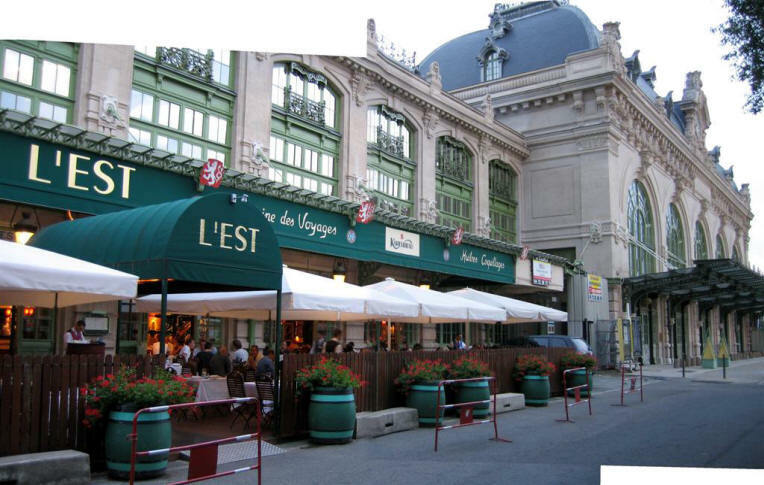 She recommended that we have dinner at Brasserie L'Est [14 place Jules Ferry, +33-43-724-2526.] 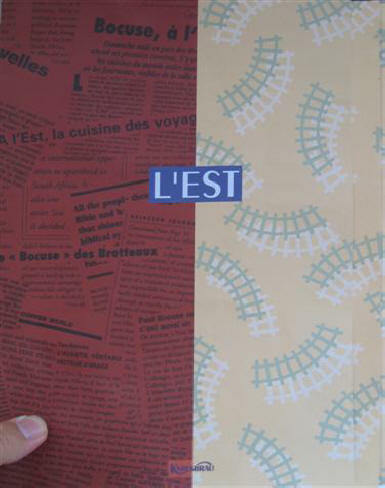 The brasserie was opened by the famous Paul Bocuse and L'Est is situated in the former Brotteaux Station. She was accompanied by her friend from London, Lisa Forni. I have known Kris for many years, first when she worked for an ophthalmic trade magazine called Ocular Surgery News. When she moved on to work for Bausch & Lomb (the big optical giant,) they moved her to London and we have stayed in contact. They beat us there, so we joined them at their table. What a neat place. We all shared Evian, Badoit waters and a bottle of Montagny 1er Cru [1er=1st], Domaine Laurent Cognard, 2003 (above right.) Marcia had a salad with artichoke and then some mixed fish. For dessert she had strawberries and crème fraise. For dessert I had strawberries and chantilly cream with fruit sauce and a cappuccino. 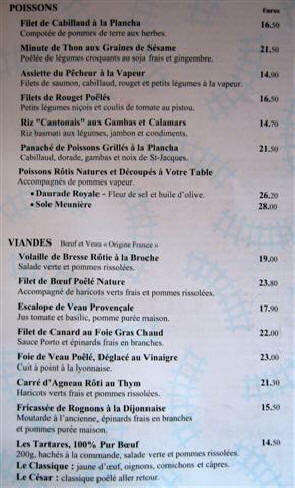 Kris was dying to have some foie gras (below left.) Then she and Lisa had some wonderful fish dishes. For dessert they had a fabulous strudel and sorbet with fruit. Kris was so sweet by treating us all to dinner. It was all very good and we had a really wonderful time. We look forward to seeing her again when we attend the ESCRS meeting in Lisboa. We then drove back to the hotel and after working on the computer for a little while, I got to bed at 3 AM.